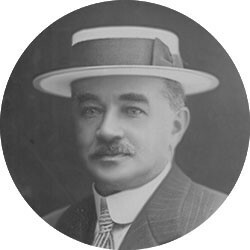 Born 1857, Milton Hershey is the founder of the Hershey Chocolate Company located in Hershey, Pennsylvania. It was early on in life, while working on the family’s farm, that he learned the values of persistence and hard work, carrying that with him throughout his life during his elder years. Milton Hershey left school after just two-and-a-half years, instead opting to apprentice with a local printer. One day, he dropped his hat on accident into one of the machines there and was subsequently fired from that job. That was 1871 and Hershey was just 14-years old at the time. After working for a candy factory near Lancaster, he decided to start his own business, opening a candy store close to Philadelphia. That business failed. He left town and headed to New Orlean’s and then Chicago. Unable to find the right opportunities, he continued moving around until he settled in New York City where he started working for Huyler’s, a candy and restaurant chain. After a few years on the job, he quit and decided to sell candies on the street in New York City but was also unsuccessful at that as well. Disheartened by failure, Hershey moved back to the farm where he grew up, experimenting with chocolates and candies, considering he had a large supply of fresh milk from the dairy cows. It was here that he learned how to make delicious chocolates from condensed milk. In 1893, at the age of 36-years old, he established the Lancaster Caramel Company, which he eventually sold for one million dollars seven years later in 1900, giving him the ability to start the Hershey Chocolate Company. When Hershey Chocolate Company first opened its doors, Hershey was 43-years old. Success didn’t come early for Hershey, nor did it come easy. But Hershey’s chocolates are still today one of the most famous and best-tasting brands of chocolate in the world.